Art in Bloom is an annual event and exhibition celebrating the David Owsley Museum of Art (DOMA) through innovative floral interpretations created by the region’s top floral designers. The Friday opening reception is in support of the museum’s programs and acquisitions, and the free, public exhibition is displayed throughout the weekend. 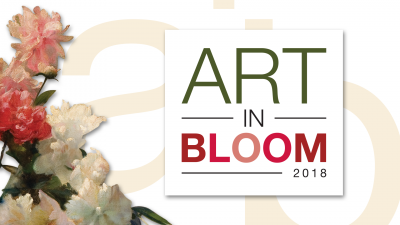 Art in Bloom 2018 begins with a gala event at 5 p.m. May 18; tickets are $50 per person and include cocktails, hors d’oeuvres, entertainment, and the first look at the designers’ artistic interpretations. The floral arrangements will remain on view for the public May 19 and 20 during normal open hours with free admission. DOMA thanks our presenting sponsor Sursa Griner Wealth Management of Raymond James for their generous support. Entrance decorations will be provided by our friends at Wasson Nursery. More info and tickets available at bsu.edu/doma. Art in Bloom is an annual event and exhibition celebrating the David Owsley Museum of Art (DOMA) through innovative floral interpretations created by the region’s top floral designers. The floral arrangements will be on view for the public May 19 and 20 during normal open hours, 1:30-4:30 p.m. As always, the museum is free and open to the community! A docent-led tour of Art in Bloom is offered at 2:30pm on both Saturday and Sunday. Visitors to this special exhibition can vote for their favorite floral arrangement! This People’s Choice Award will be announced on Facebook on May 22.